Gary arrived at IPPL on May 13, 2013 along with his mate Glenda, their daughter Kendra, and their son Thai. They came to us from a tourist attraction in Silver Springs, Florida that was closing its doors, dispersing its collection of exotic animals, and being taken over by the state. 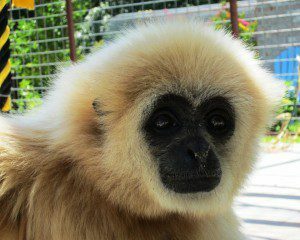 Gary is a petite, blond gibbon with lustrous, pale fur. When he arrived, we could hardly believe that he was the dad and that great big Thai was his son as Thai was twice Gary’s size! Gary is quite the acrobat, and gracefully flips, spins, and twirls all over his outdoor enclosure. Animal care staff members have seen nearby gibbons attempting to imitate Gary’s uniquely smooth moves, especially the ones with lots of arm action. Unfortunately, they are not nearly as successful in completing Gary’s peculiar pirouettes. While he is very shy around humans, Gary will always come over and interact with the animal care staff if they have fresh mango with them, as that is his favorite food. He will eat it so quickly that for the rest of the day he will have mango smeared all over his face!